« MovieBeam closes. Bad news for Vudu, AppleTV? With the introduction of the Amazon Kindle, alternative ways to read books is back in the public eye. Problem is, where are they going? And will they ever be accepted after years of promise? Indeed. Most people, particularly authors, publishers, and book lovers, passionately believe that the book is perfect and will never be improved, even in an era of digital upheaval. Books do not have storage memory, displays, or power sources. They’re bound paper with words and images, sturdy, reliable, always-on, with a fabulous user interface. They feel great in our hands, smell good, and when we’re done reading we shelve them like trophies. And yet it’s inevitable that the book will ultimately succumb to digital technology, which has already consumed music, film, video, photography, and communications and is turning those industries inside-out and changing society. There’s no reason not to believe that digital technology will do the same to books. Unfortunately, alternative book reading remains an unfulfilled promise, hampered by poorly designed hardware, cumbersome user interfaces, scant content, competing formats, digital rights management (DRM), and a misplaced business model. For now, consumers have no compelling reason to stop reading printed books. In this post, we examine the state of alternative book reading, what choices people have, what works, what doesn’t, and what resources are available. Audible.com is included in this survey because it is a form of alternative “reading”, and it offers a stark contrast between doing things right and doing things wrong, which is the path the eBook industry is taking. The spoken word industry has evolved alongside technology, moving from books-on-tape to books-on-CD to books-on-the-Web. Audible, now 10 years old, is the Internet’s leading audiobook service, offering a surprising amount of recorded books, audio entertainment, original content, and helpful Best Of lists. The Audible experience is everything eBooks should be but are not. Audible’s content is copy protected, but that doesn’t impede it from being accepted by book lovers. Audible’s file format is compatible with dozens of MP3 devices, cell phones, and PDAs, so there’s little confusion over what will work. Audible’s store is very much like Apple’s iTunes, although in addition to paying for individual books you can also subscribe to monthly download plans. It’s easy to browse and find new books by categories, recommendations, what’s new, and search. All in all, Audible has its act together better than the eBook industry and is a compelling book-reading alternative. Books are a $35 billion-a-year business but reading them on anything but paper has never caught on. Dedicated electronic book readers began to appear in the late 1990s, but RocketBook and SoftBook were bulky, battery challenged, and counter intuitive. 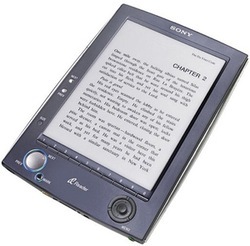 Sony breathed life into the eBook market in 2006 when it introduced its first Reader (PRS-500) and opened an accompanying Internet-based bookstore. The first Reader underperformed, but to Sony’s credit it stuck with it and introduced a second version (PRS-505) in November, a much more elegant, user-friendly device. Together with the Kindle, interest in electronic book reading is at an all-time high and eBooks finally have a chance to take off. Next up, we take look at the issues surrounding all eBook readers and what’s unique about four leading devices — the Kindle, the Reader, Bookeen’s Cybook Gen 3, and iRex Technologies’ iLiad. These products are mostly techno-centric, not user-centric, and book lovers will not be won over until the manufacturers understand readers and develop devices that facilitate their needs. The hardware is too expensive, ranging from $300 to $700. Like all technology, prices will drop. But when? And what will average readers be willing to pay? User interfaces are improving but they’re still not acceptable for most readers. One reason the iPod took off was because of an easy-to-understand user interface. Today’s readers are flow devices; in other words, text flows from one page to the next. There are no sidebars or callouts. There’s limited graphics, footnotes, and notes. 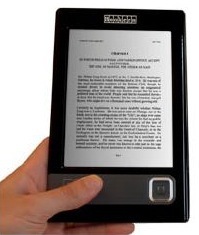 With the exception of Kindle and the iLiad, electronic readers cannot highlight or annotate text. All use different forms of DRM, dictating which devices and bookstores can be used together. 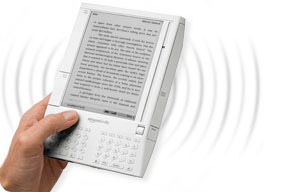 This generation of eBook readers uses a new technology called eInk, developed by the MIT Media Lab. eInk is revolutionary and provides a pleasant, easy-on-the-eyes reading experience. The complaint is that eInk does not immediately refresh the display when turning a page. It’s like the device blinks — frustrating for some, not for others. While these are mostly negatives, electronic book readers do offer near-term advantages over printed books — from changeable text sizes to being able to carry hundreds of books in a 10-ounce device that’s slightly larger than a paperback. 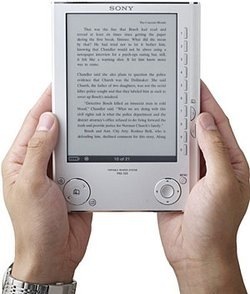 Amazon Kindle ($400): The real innovation here — which will impact products and services far beyond book selling — is that the Kindle is always on and connected to the Internet through Sprint’s EVDO wireless technology. This pervasive connection is “free” to the user who doesn’t need to connect the Kindle to a computer to download new books, newspapers, magazines, blogs, or to access Wikipedia. It’s the beginning of the “books as a service” concept. The Kindle’s major drawback is that its DRM (AZW) limits users to content purchased from the Amazon store. At least for now, books bought at Sony Connect or at Mobipocket, another leading eBook store, cannot be viewed on the Kindle. Sony’s user community is also highly active and has developed software (libprs500) that can take another format downloaded from the Web — Microsoft’s LIT, for example — and convert it into LRF files, greatly expanding the choice of eBooks. One unique feature of libprs500 is that it “fetches” content from a Web site and converts it into the LRF format. Sites are limited at the moment but do include The New York Times, Newsweek, and The Economist, but the daily paper or newsweekly must be uploaded to the device by computer, not wirelessly. 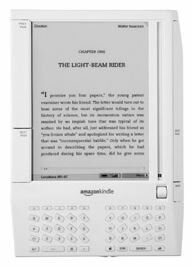 Cybook Gen 3 (starting at $350): Bookeen’s electronic reader is a competent alternative to the Kindle and Reader. It’s reasonably attractive, shares many of the same features and functions of other readers, and it is supported by Mobipocket. iRex Technolgies iLiad ($700): The iLiad is the most expensive electronic book reader, but it’s also the most feature-rich. With the iLiad you can read and annotate books directly on the device, transferring comments to a PC or another iLiad — handy for serious book readers, educators, researchers, and rich students but overkill for the casual reader. The eBook industry is so fragmented that the best advice is to check out the blog mobileread.com. It follows all eBook products, industry developments, and its user forums and wiki are active and informative. As much as the eBook industry is fragmented, so are the stores that carry eBooks. Make sure the books you purchase can be viewed on the reader you own or are considering purchasing. These stores also carry different content, so visit each, browse, search for titles you are interested in, and go with the one that best suits your needs. 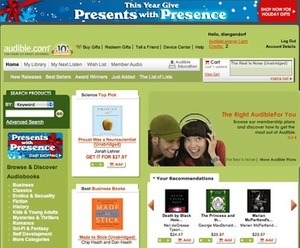 The stores include: Amazon (the biggest selection), Sony Connect (the worst selection and user friendliness), Mobipocket, eReaders Outfitters, eBooks.com, Fictionwise, the eBookMall, among others. One of the nice things about eBooks is that you can download digitized content for free from many sites, including Project Gutenberg, the eBook Directory, ManyBooks.net, and others. For an up-to-date discussion on digital publishing, see Jeff Gomez’s book “Print is Dead” and his blog. Unfortunately, even with Amazon’s Kindle and the second-generation Sony Reader, electronic book reading is still for early adopters. The eBook industry has a long way to go to sort out hardware, DRM, formats, content, and business models. * ubiquitous: both penetration in the population and capability will increase. * ultra-portable: the phone is a ‘must carry’, people are almost never without it and thus it is designed to be easy to carry. * connected: all that Kindle goodness is already included. * based around the human hand / pocket: the ergonomics are centered around one handed operation, lightness, etc etc. Phone screens will probably grow to ‘cover’ the whole device, but they probably won’t get much larger – already the iPhone is probably ‘too large’. You can build a book reader that takes advantage of all the above features, works within the constraints, and delivers a good reading experience. You can see an example at http://www.booksinmyphone.com they have hundreds titles they give away. You can install straight from their mobile site, or via PC. @ nick: i thought about cellphones, and i wish the iPhone had this capability. but the more i used an electronic reader, the more i appreciated the display (can cell displays be easy on the eyes for long periods?) and reader-dedicated interface (even with its flaws). we’ll see. it would be great not to carry yet another device. @nick: I do see your point, but I think I would go crazy trying to read a whole book on my cell phone. All of the interesting properties you mention that the cell phone has are true, but I don’t think that is enough reason to use it as a book reader. But maybe I’m wrong. Maybe I just think that I would go crazy trying to read a whole book on a cell phone because the idea seems so foreign. Ebooks on mobile is convinient way to cut the travelling time required these days. I normally dump ebooks on my cell and read them on my way to and from office. I do a travelling of 2 hours and now I spend the same by reading ebook and listening to music which is the most productive use I can do. Also while I am travelling out of town it helps a lot. I used to bring several books while traveling before I have my Nokia Communicator to save some documents. But it’s limited to numbers of kilobytes of the file. I really want to have a small eBook reader but since I only have laptop, i used it for reading, storing and sometimes creating new eBooks. Now, There’s an UMPC with tablet style (kojinsha), a smaller laptop that ease me to read ebooks and work while I’m mobile. IMHO, eBook reader will be less useful compared to the UMPC since UMPC have the ability not only to read eBook but also to use softwares for other jobs. The UMPCs’ price now range from US$ 350 to US$ 900. Quite cheap and useful.. The way I see it the current technology lacks a major aspect and that is the ability to cross several platforms. For instance the Kindle 2 will only download amazon books. I agree that Amazon has the largest collection including newspapers but when a reader comes out that I can put any ebook on I will buy it and use it often. Online that problem has been solved with Adobe that crosses all platforms. Offline there is lots of money involved in the purchase of the ebooks or materials for the readers. The second problem is that many people still prefer an actual hard copy to lay in bed and read. The new digital readers are not really comfortable and there is just some tact feeling that is not represented in an actual book. The new readers are nice and I do own several but they all have their problems at this point. So I do agree with the author for the most part but as to wheter or not they will replace standard books remains to be seen. I do a travelling for hours and now I spend the same by reading ebook and listening to music which is the most productive use I can do. Also while I am travelling out of town it helps a lot.